Wednesday April 15 some committee members were able join me as we put in three packages thanks to the generosity of Ruhl Bee. We placed them in eight frame hives, which now have pollen and sugar water to help them get set up. Once the sugar water is gone from the bucket, they will be on their own to live out the summer and thrive with Zenger Farm’s food supply. All of the packages are thriving with their queens; we will continue to keep you updated as these hives continue to grow. It is very exciting to think that we have three varieties of hives that one can observe and learn from; we have ten 10-frames, two 8-frames, and one Kenyan top bar. Taking mite counts at Zenger Farm. We had a great Saturday last Saturday and I think the teams were very successful in their accomplishments. A big thank you to all who turned up and helped out! It was sure great to see the enthusiasm and I think we all learned a lot from each other. We learned how to check for mites and treat with Hopgaurd. We will provide results next week when we test again. Don’t worry if you missed this session, we will be testing again to see where we stand throughout the summer. So far what we learned was that we have three mites out of eight hives checked. This is GREAT news! However, we must be diligent when it comes to mites. Mites can easily get out of hand. If you see mites on your bees, it usually means there are a lot more mites then just that one that you see. Since, we are using IPM treatments, diligence is the key. We treated all the hives except for the two that wintered over, and the hives that just received packages. Want to test your hives? Note: There are many ways to gather up the bees. I find brushing the bees, or scooping them off the frames difficult, especially when I am by myself. So this is what I do when I test for mites. Shake the bees into the bucket. Pick up the bucket and over the hive dump the bees into the jar. Many bees will fall back into the hive (you are only looking to have 300 bees, which is about a 1/2 cup). Put the mesh lid on the jar. Using your hive tool take two scoops of powdered sugar and put it on the mesh lid. Shake gently or cut the powdered sugar into the jar. Let sit for 2 minutes in shady sunny place. Shake vigorously upside down to shake the mites out over the sprayed plate or lid. The powdered sugar will dissolve as you continue to spray the plate or white lid. Look for Brown or Red moving dots. They can be hard to see, so if you can take a spy glass that could also be helpful. Return the sugar-coated bees back to the hive. They’ll be a little “shaken up,” but they’re alive and will be cleaned up by the other bees. Last note: If you see 10 mites this is considered to be a high number. During lower mite-times add one zero to your number. During high mite-times (when a lot of drones are being born) add 2 zeros. There are ways to fix this without using chemical treatments, which we will show over the summer months. Come join us, good beekeepers are versatile beekeepers. Our young beekeeper Luca received his first hive and swarm just the other day. Luca has a passion for beekeeping. If you ever see him at PUB he is not afraid to say hi and talk bees with people. We are very proud of him and we are proud of his accomplishments. He is very inspiring. 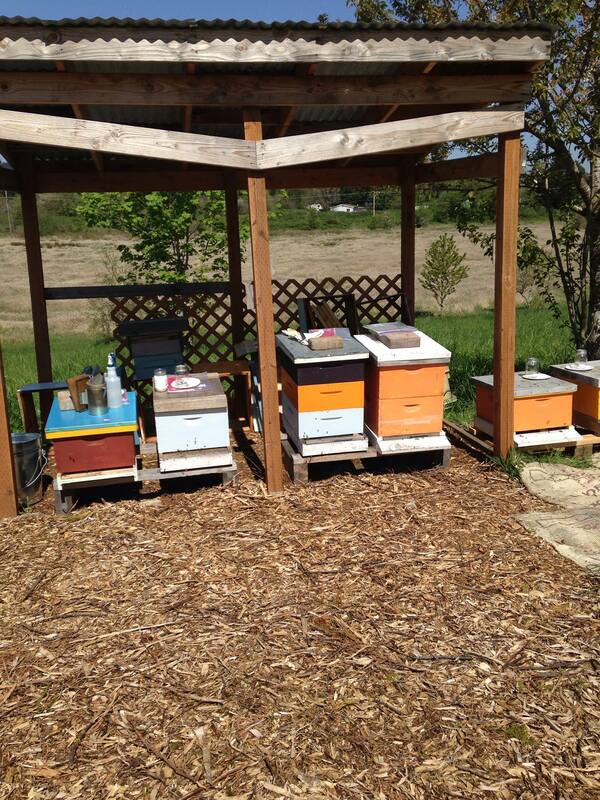 He put together his hives and the ZFAC community pitched in with some frames and a swarm. He is now a proud beekeeper who will be learning from the bees, along with his mentors and Zenger Farm Apiary. GOOD GOING LUCA!!!! KEEP UP THE GOOD WORK! Come join us as we start to make plans for our pollination garden. Comcast work party is making more room for us so that we can have a bigger area around the hives. Do you have a sense for writing? 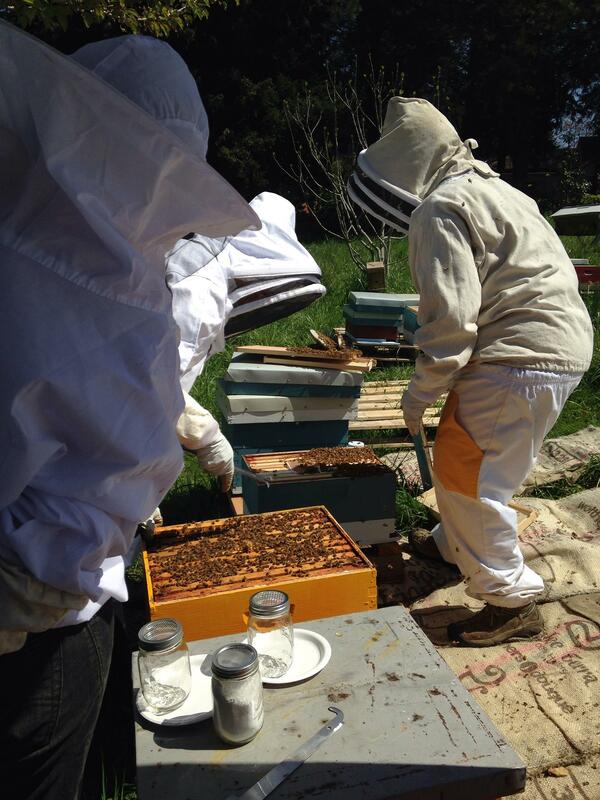 Are you interested in serving Zenger Farm Apiary, but you can’t always get out to us? Blog for us, and let people know your experience that you have at the apiary. You don’t need experience. Everything goes through editing before it gets published on the PUB web page. It’s a way you can personally express yourself to the world about your love for the bees and the Zenger farm community. We are looking for experienced grant writers to work with Zenger Farm and PUB. We are working towards getting a shed. Right now we are so desperate for a shed we are getting creative with buckets and beehive boxes. We have a shed but we have to walk quite a ways to get equipment. Zenger and ZFAC are working together to make it happen. We just have to write the grants and the next steps will fall into place. 6/26/2015 tbd Zenger Farm Volunteer Appreciation Day. Come join us and celebrate our success. 7/18/2015 Dr. Dewey Caron will be joining us (subject tbd). We are starting out very strong this year!!!! What an amazing weekend!!!! What was going to be a rainy weekend ended up being perfect to install nucs. Thank you to all the people who came to help put the nucs in. It was wonderful to see the enthusiasm and collaboration among our community. What a great team we all make when we put our minds to it. A huge thanks for all the effort that went to setting up the apiary. We could not do it without your help. As we all know the work is never done. Nevertheless, we are just that much further as we journey together on this learning adventure. Zenger Farm Apiary is now up to ten hives and counting, we have three more packages coming thanks to Ruhl Bee’s generous donation. We will install the three packages next Wednesday 4/15/2015 at 2 pm, if you wish to join in the fun. This makes a total of 13 hives. We are still expecting swarms and splits. I just hope we have enough equipment!!! The nucs came from Foothills Honey Farm in Colton, Oregon. If you just happen to hear Hawaiian music, or hear a little “Aloha” it is because the nucs are from Hawaii. The bees are a mixed breed, and all the nucs seem very strong in their own right. 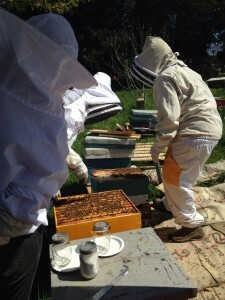 Each nuc contained five frames which included 2 frames of honey. There is no need to feed pollen or sugar at this time, if you also went to George Hansen’s place. As we continue to look forward it is very important to look for signs of the Queen, or the Queen herself. We know one is camping in a feeder at the moment, we hope this will change by tomorrow so I can return all the boxes with all the feeders intact. Now What Do I Do Now That I Have Bees? Have patience and take your time. Each colony will have its own personality. Let them get established this week. Especially packages. Do not disturb packages for the first one or two weeks. 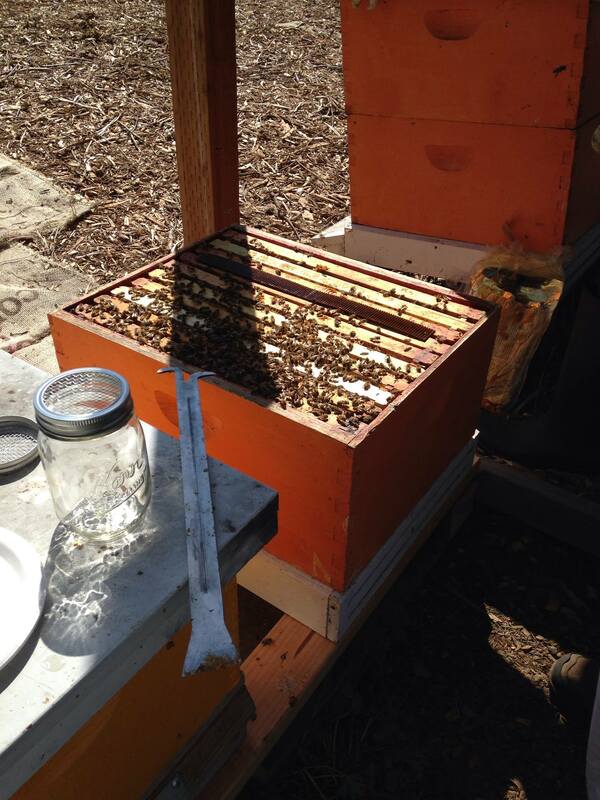 Top bar beekeepers – keep an eye on the comb and then let it go. Once the comb is drawn straight then become the hands off beekeeper you want to be. Bees are great at cross-combing, which can make opening up a hive difficult. This can change a positive experience into a negative one. If you are new to top bar please consider going to classes and getting a mentor to have the best experience. Keep an eye on honey stores. If they get low start feeding sugar water – 1 part water to 1 part sugar (by weight or volume), if you are inclined to feed. If you wish to know mite count, check for mites once a month. Make a decision depending on what you see. Relax, have fun, and enjoy the beauty that these lovely ladies and gents will bring. The sugar Maples are coming out in full force and that means there is a beginning food source for the hives. We are a month early with our blooms, so keep looking out for different colors of pollen that will be coming your way. ZFAC has an opportunity to get its own shed!!! We need to raise $2500. There are a couple grants that could give us some money. If you know how to write grants, or wish to participate in grant writing we need you!!! I personally am dying for a new shed. I am sure anyone who has been out at the farm understands completely. We also need a cleanup committee to come and clean the donated frames and boxes that have come our way. The cleanup committee can create a schedule that will fit into work schedules. I will bring a sign-up sheet for a work committee Saturday the 18th. Whatever the work committee has not finished we will finish on the third Saturday. If we want the 8-frames to be at their best, we need to get together and do this. So let’s find time in our busy schedules to help out. The work is less if more people come and help out. Please do not burn your leaders out! Please help us by coming to the work parties. It makes a better apiary experience for everyone! June 26: Zenger Farm Volunteer Appreciation Day. Come join us and celebrate our success. Now that we have bees we’ll be planning out some education and experimentation programs. Everyone will get a chance to learn about the various methods of treating and managing bees. We will be splitting into groups. All groups will be learning how to do mite counts and apply organic chemical and non-chemical treatments. Groups are responsible for logging progress and communicating what has been done on the folders that will be established at each hive. Please write legibly and take notes as you go along. All the information gathered will be logged onto a larger database so that we can see the actual changes that have occurred over the season. This is really good practice for everyone, including myself who tries to do it all by memory. Good beekeepers keep progress notes. A sign-up sheet will be handed out at the next meeting. If you are unable to come to the meetings and you wish to participate, but don’t express which group, you will be put into a group. The groups will stay together for the summer. Please RSVP (comment below) to let us know that you want to participate in this project. Sign-up sheet will be available till the end of May. You can also email me directly. Dr. Dewey Caron will be joining us in May at the next meeting to talk about queen rearing. I know this sounds very advanced. However, it is important to understand bee biology and how it all works, everything is connected in some way. Regardless of where you feel you are in beekeeping please come, I know we have some advanced beekeepers in our group. It’s a great opportunity to hear Dr. Dewey speak and possibly get some one-on-one time with him because it is a smaller group. The more you learn, the more you know and the better beekeeper you will become. Friday, 4/24/2015, 9-12 pm – Comcast work party is happening. We are getting them to dig up the grass and mulch over the newly dug up land. I get to be forewoman (Tee Hee). Wednesday, 5/27/2015, 2-3 pm Hive Inspection. Friday, 6/26/2015, Time TBD – Zenger Farm Volunteer Appreciation Day. Come join us and celebrate our success. Can you teach me to speak bee?